What’s all the fuss about? Why must one technique be “better” than the other? Why can’t emphasis be placed on high level craftsmanship, rather than the unnecessary and unfounded claims of one technique’s “superiority” over the other? For centuries, the traditional method of stained glass fabrication called Leaded has utilized H-shaped strips, or came, to capture within its channels, each edge of the individual glass pieces in an art glass project. Then, at each joinery or joint, the lead came is soldered. Finally, the window is glazed with putty in order to solidify the overall panel. In the late nineteenth century, the Copper Foil technique, also called the Tiffany technique, was introduced as a way to better construct 3-dimensional works, such as lampshades. 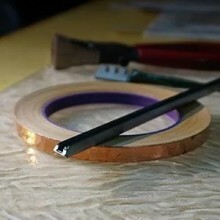 This labor intensive technique involves positioning strips of copper tape on the edges of each glass piece, then crimping and smoothing. Now the panel is ready to be lead soldered along the entire seam, front and back, thereby solidifying the panel. There’s no need to discriminate. If techniques are properly executed, lampshades can be leaded and large windows can be copper foiled. Each technique has its advantages and disadvantages, strengths and weaknesses, and vulnerabilities. Again, I emphasize that focus should be placed on and remain with high level craftsmanship in order to ensure structural integrity and visual appeal. Let’s strengthen our knowledge and let go of our prejudice as a means to enhance our profession as a whole. I admire the true masters of these techniques, don’t you? Tags: copper foil method and leaded stained glass.